Learn how to pass your exams while studying less with strategies from the world’s youngest actuary. 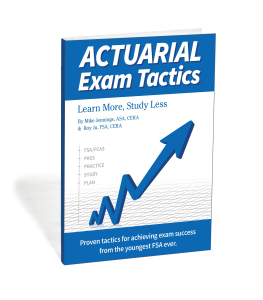 That's the premise of the newest book in the ACTEX Learning catalog, Actuarial Exam Tactics: Learn More, Study Less, now available for pre-order on our website. This book presents the study strategies that helped Roy Ju become the world’s youngest actuary, finishing the SOA’s exams, and becoming an FSA, at the age of 20. At this point, most actuarial students will be asking: these strategies worked for Roy, but will they work for the average actuarial student? This was the primary question that co-author Mike Jennings asked when first learning of Roy’s strategies. After fifteen months of testing these strategies and accelerating his own exam process (passing 2 preliminary exams, a fellowship exam, the FAP modules and the FSA modules over this period), Mike knew that he and Roy had to share these strategies with all actuarial students. With early endorsement from professors and actuaries who have been through the exam process, this book is sure to transform the study habits of actuarial students to help them pass their exams while maintaining a healthy work-life balance. Customers can sign up on Roy and Mike's website, Rethink Studying, for exclusive access to sample chapters and study tips prior to the book's publication date of May 16th. Customers who order the book before June 1st also get access to a free live webinar on June 6th with Mike and Roy. The book will ship in electronic eBook and printed formats on Tuesday, May 16th. Next What Technical Skills Should I Learn As an Actuarial Student?